Just got back from a short five day break on Dartmoor National Park. We have been to Dartmoor on a few occasions but never stayed in Dartmoor itself. We stayed in a cottage just of B3212 near Darcombe. We arrived at around 14:00 hrs and were greeted by the owner who allowed us in an hour early. Lovely lady , very friendly and down to earth. She showed us in and then left us to it. There was all the tea making facilities all laid out on the table along with cup cakes and fresh cut flowers, very nice welcome. Once we had a short rest, we then unpacked and got ourselves settled in. Due to it being later in the year than we normally visit the light was already starting to fade, so we decided to just wander around the ten acres of land we were in. The next day we decided to head off onto the moors and visit Haytor and then on to Widecombe-in-the-moor in the afternoon for something to eat.We parked in the tourist information car park at the base of Haytors Rock , instead of walking straight up as we normally have we decided to take a detour and walk a 3 mile round route that weaves through the moors and around the back of Haytors Rock via an old Quarry. We even managed to locate couple of Geocaches on the way. 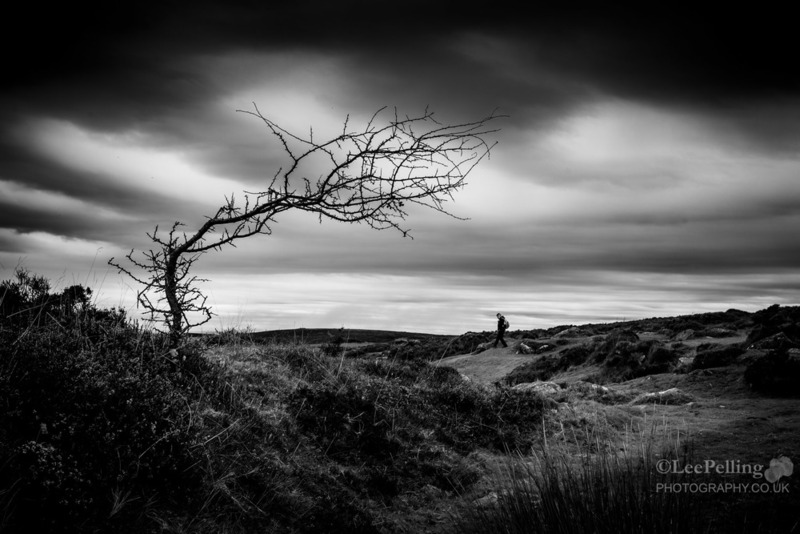 Dartmoor really does lend itself to Black and White photography this time of year, the moors are so vast you feel you are miles from civilization with just the odd livestock wandering around. The moors were a mix of autumnal colour and areas of baron land dying back for the long winter ahead. Really enjoyed this walk, first time we had wandered around this area but so glad we did, the area behind Haytors Rock hides a deep disused quarry that really is a fair drop, a warning if you have kids with you to keep a close eye on them when around this area. Today we decided we would go in search of the twin waterfalls somewhere out in Venford. We had found a rough location of the falls online so we programmed the gps and decided we would set about finding them. We parked at the car park across the bridge of the reservoir and instead of heading out towards the reservoir itself you head in the other direction. The weather was looking a little unsettled as we set off so we had no idea of what lye ahead of us. This time we were prepared with plenty of waterproof clothing and a decent pair of boots. Unlike the first time we visited here many years ago with all three kids. The Garmin Montana 650 hand held GPS unit was leading us off along a path at the top of Venford Brook. After walking a little way it became clear that we would have to descend down into the valley and into the forest below. You could hear water but at this point it could not be seen. You have to watch your footing going down this way as it was getting a little steep , i was a little concerned that i might loose GPS signal but it held lock even under all the forest canopy . Eventually, once we had navigated our way down through the steep bank through the trees and the bewildered looking sheep we started to see the first signs of the water running along the bottom of the valley. Eventually my wife thought she could see someone else. Turned out she could, another local photographer has already had beaten us to it today. Wish i had found out his name as he gave us some tips on other locations, really nice guy. It was really worth the effort it took to find this spot, and we were lucky to have come at this time of year after all the rain as this and all the other falls and rivers we found were full and fast flowing. If you have a gps the location is N50° 31.815' W3° 51.109' well worth a visit if you in the area. After photographing the twin falls we managed to cross the river, thanks to my Benro Travel Angle 2 Carbon fibre tripod that had a detachable leg that can be used as a monopod or a walking pole, handy ! We eventually made it up the side of the valley onto a path and headed out towards the River Dart. After walking a fair way we decided it was getting late in the day so headed back along the path which eventually leads out to the pumping station behind the reservoir, you then cross over the road bridge back towards the car par. The satisfaction of finding the falls made it a great day out. This time of year was just spectacular , walking through the dense woodland , no crowds!, and the autumnal colours were amazing. I could not help but stop every few yards to take another shot, there were endless exposures to be had. Honestly i could still be there taking photos , will definitely return here one day cant recommend this place highly enough. There is a few areas where you have to walk around the river on a very narrow pathway so a iron handrail is provided but it all ads to the enjoyment of the place all the way round to the Devils Cauldron. I cannot begin to tell you how loud this spot is and the immense power of the river is just exhilarating to be there. Lydford Gorge is a must for anyone in or even near Devon! We did not really have a plan for today so i set about looking at the OS maps and found what i thought might be some good geographical features. Tight elevation lines two converging rivers and a rocky summit with woods, the place i found by chance was Dewerstone. The drive down was going well right up to the final couple of miles where the road just turned into a single track barely big enough to get just my car down and if anything came in the opposite direction well it could of been a challenge! Luckily we made it without a problem. Parking in the car park did not give much away as to what was waiting. This was the raging River Plym in Dewerstone, i do not think i have ever seen such a ferocious river in all my life. The noise was amazing, stood on a wooden overbridge i set up my tripod ! When we managed to drag ourselves away from this magnificent river we made our way through to Dewerstone woods and followed the path up to Dewerstone Rock. Towards the top the path split into a steep climb up or a footpath round the longer way, yes we took the steeper path. As you can see the route through the woods is very picturesque. When we made it to the summit we did stop and have a break , a quick bite then wondered around the top taking in the great views. We then decided to head back down towards the car, yep via the steep path, much to the great joy of my wife !